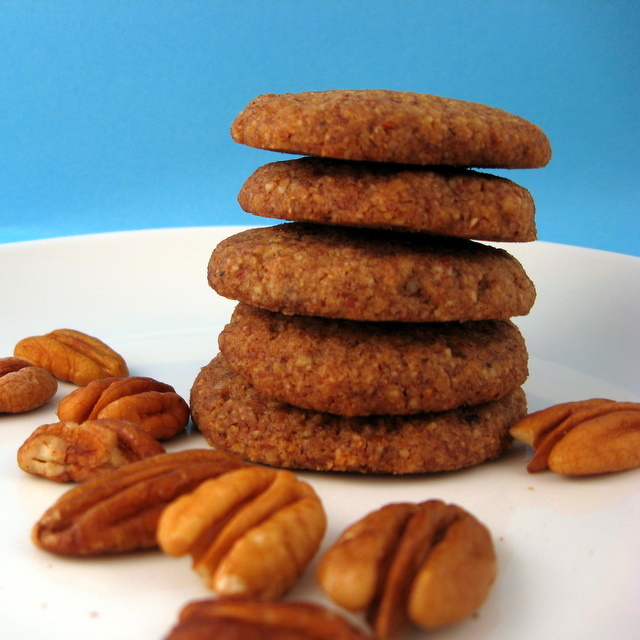 Did you know that today is national pecan cookie day? Yah, me neither. But, I happened to see Foodimentary tweet about it this morning. And, it just so happened that I had “make cookies” on my to-do list for today. No really. I did. See, I’m heading off to Seattle tomorrow and my parents are coming down to help out with the kiddo while I’m gone. My dad likes to have cookies in the cookie jar. I think I might have mentioned before that chocolate chocolate chip is his favorite. But a close second is an old family recipe for pecan slices. So, I pulled out the old 3 x 5 recipe card and de-glutenized them. Actually, I de-grained them and veganized them, too. Here’s hoping he likes the new version. I’ll probably still tweak this recipe some. But, I figured I HAD to post it today, it being a national day of observance and all…. In a medium bowl, beat the coconut oil, maple syrup and vanilla until fluffy. Add the rest of the ingredients. Mix until it comes together like a cookie dough. (It will be crumbling first – don’t worry – keep mixing!) Roll the dough into small balls and place on cookie sheet. Flatten with the bottom of a glass. Bake for 15-18 minutes, until lightly browned on the edges. (The pecan meal is already fairly dark, but you will be able to tell when the edges brown a bit.) Cool completely. Cookies will be fragile and crumbly until completely cooled. Notes for next time: I think I might try adding just a tiny amount of xanthan gum to this recipe – perhaps 1/4 teaspoon. And, I might decrease the coconut oil just a touch. They’re delicious as is, but I’m constantly tweaking recipes, and those are the tweaks I’m thinking of next. With only 2 tablespoons of a natural sweetener, I think these cookies qualify as “Slightly Indulgent” – don’t you? Check out all the great recipes posted at Slightly Indulgent Tuesdays. Also check out the exclusively gluten-free round up over at Gluten Free Wednesdays! This entry was posted in cookies, grain-free, nuts, vegan. Bookmark the permalink. Oooh, so glad you did a coconut flour recipe without eggs. I am totally on the lookout for those 🙂 These look great. Thanks Valerie, I have a few of them up here now – like the last three or so. And I’m sure there will be more to come! Still haven’t tried baking with coconut flour. Your cookies look worthy of trying it out. Have a great time in Seattle. Love that city and its food. Your book should be at your house when you get home. Well, they look delicious and lovely. I hope he likes them! Deanna, I love this recipe! I am so going to give it a go. I am guessing they aren’t very sweet though, no? They’re actually surprisingly sweet, if you don’t have a typical American sweet tooth. Nuts have sweetness to me, and so does coconut flour. They’re certainly not over the top sweet – but they taste more like a cookie than a cracker, definitely. Let me know what you think when you try them out. Great picture and great looking cookie. I can practically taste it just by looking at the picture. They look perfectly sweet and crunchy and they’re going on my must try list! Wow! Those are lovely! And no eggs with coconut flour! I’m impressed!! I really want to try these gluten free cookies!! Great recipe! I really appreciate gf, vegan, cane sugar-free baked goods. Having grown up in GA, I love pecans, but I was never a fan of the pecan pie hoopla. This looks great! I might even add some small bits of chopped up Endangered Species chocolate bar for an extra-special treat for a potluck, because I remember that my dad used to give all of his friends chocolate-covered pecans as Christmas gifts….. and they were amazingly delicious. YUM!! I haven’t been able to find coconut flour yet. Where do you get yours? I get it at our local grocery store. (Bob’s Red Mill is the brand I’ve been using.) It’s available online as well. I first tried the “Let’s Do Organic” brand and that doesn’t work – it’s not really flour. It’s more like ground coconut. I bought some coconut flour a while back but have yet to try baking with it. These look so lovely! Thank you Carol! I’m glad you like the looks of them and hope you give them a try! For a long time I struggled with coconut flour, but I think I might be starting to get the hang of it. 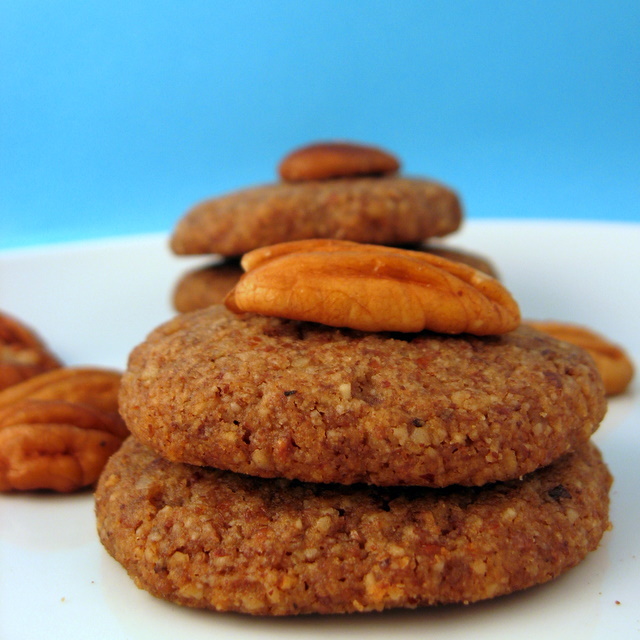 Oh, a cookie recipe without gluten, dairy, or EGGS! Can’t wait to try these. My daughter is on a gluten-, dairy-, and egg-restricted diet. This will be next on our list of baked goods to try! Thank you! You’re welcome Elizabeth. I have a few others on my site that also meet that criteria. Be sure to check out the chocolate chocolate chip cookies. Those were a super hit with the kiddo. (The pecan slices were a little too “grown up” for his tastes. He wants a sugar rush, don’t ya know. Do these taste coconut-y? I’m not a fan of coconut but I’ve never had it with pecans. No, I don’t think they taste all that coconut-y – not like an almond joy or anything like that. The pecan flavor is the most predominant one, for sure. I was thinking maybe in place of the coconut flour, since it wouldn’t be that hard to grind pecans. Too much nut flour? Ooooh. I thought you meant in place of the pecans. Hm… I’m not sure it would work. If you don’t mind a little grain, I’d maybe use some sorghum or millet flour. Or, I’d try all pecans, but you might have to tweak the amounts a little… Or try some ground flax seed…. Anne – I tried to make these this morning without the coconut flour. I was out of pecan meal, so tried it with finely ground almonds (different from almond flour in that the almonds include the skins – like the pecan meal). I upped the almonds to 1 1/4 cups and added 2 T. flax seed. Nope, doesn’t work. They just spread everywhere. They might cool okay and be kind of like lace cookies. But, I highly doubt it. I could tell putting them in the oven that they weren’t going to work and I should have tweaked some more. I’m wondering if putting cocoa or carob flour in them and making a chocolate version would be binding enough…but then you’d probably need more sweetener. If people want me to, I’ll continue to see if I can come up with a way to make a grain free, coconut flour free cookie. I love a good challenge! I don’t soften the coconut oil at all. So, you’ll probably need to well chill the dough if you melted it. It should firm up for you when well-chilled, though! woow looks very delicious and the recipe of the pecan slices.